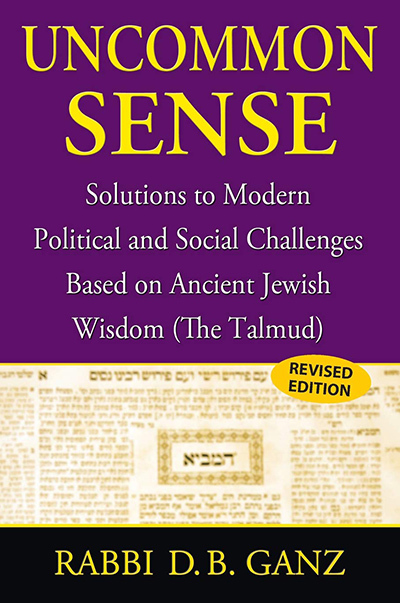 This book presents what the wisdom of the ancient Talmud (which has been studied by Jews for centuries) would likely have to say on many of the political and social topics that are now constantly being discussed in the print and media. Though very readable and “newsy,” it is at the same time both provocative and profound. This book is most unique. It takes very definite and specific positions on many of the major political issues of the time. For example, those who now decry the US government’s runaway spending tend to speak very little on how exactly to eliminate the 40 cents of every dollar spent that now must be borrowed. The book, however, makes dramatic and concrete suggestions on how to completely resolve the matter. The current public political debate mostly focuses on details of specific issues – eliminating or adding this program this program or that. This book’s positions are mostly based on timeless and overarching Talmudic principles which are then applied in a very studied manner to contemporary issues. Many books of this sort mainly focus on one or two ideas and topics. “Uncommon Sense” touches on a very wide array of topics and speaks very unambiguously (and I think with great wisdom) on all of them.